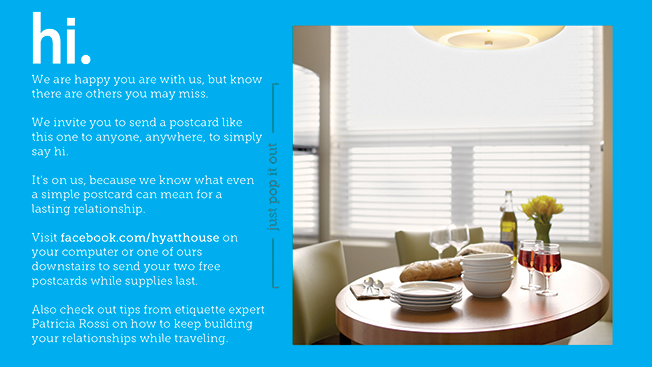 1) It engages guests and encourages them to spread the “novelty” of a postcard sent by snail mail with the Hyatt brand prominently placed. The current novelty of a postcard is key to this working. 2) It places the theme of the campaign in the hands of the guests, thusly making the theme of the campaign really the guests and their thoughts/experiences. …and these two things provide distinct advantages. They do something completely different by connecting with a guest and then providing them a conduit to connecting with another. This indirect connection is significant in that the conduit is trusted. By using a trusted conduit, their connection is validated and is very difficult to dilute. The greater the connection between the conduit and the connection, then more cemented this 3rd party connection is. Additionally, the content that’s being presented is crafted by the conduit and likely has nothing to do with the hotel, but rather the experience of the conduit. “Having a great time, wish you were here”, “Really miss you, wish you could have come”, “We’ll have to come here together sometime soon.” The connection is being addressed emotionally by the conduit and not by the brand. The brand has the luxury of being the delivery vehicle and associated with the emotion, but with a trust level that’s equal with a known person, not an empty corporation. note: we think the stock table set photo in the flyer pic is sanitary and should have been something more warm, comfortable, friendly, but that’s just us…and what we do.